Hotel Sandman Signature Lethbridge Lodge, Lethbridge, Canada - Lowest Rate Guaranteed! With a stay at Sandman Signature Lethbridge Lodge, you'll be centrally located in Lethbridge, within a 15-minute drive of Lethbridge College and University of Lethbridge. This eco-friendly hotel is 0.5 mi (0.7 km) from Galt Museum and Archives and 0.7 mi (1 km) from Park Place Shopping Centre. Room was clean and comfortable and breakfast was first rate! Close to where we wanted to be. We had a remodeled/refurbished room/suite overlooking the Atrium, which was nice. My check in was very easy. I also liked the location. The dinner I ordered in the restaurant was only so-so. Also, please tell people about the pool and hot tub up front - I would have brought my bathing suit. 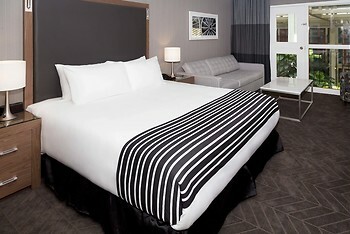 Very nice rooms, service was excellent and the lounge very relaxing and had a great atmosphere. I prefer a bathtub and I really diliked the fact that the bathroom provided little privacy with only a sliding door. Also, limited counter space. Overall, the bed was comfy but the bathroom was not great. We enjoyed the restaurant, food, pool and hot tub. I was surprised how much ti had gone down hill but I also noticed you are in the process of renovatiions. We always enjoy the hotel. The location is great also. Excellent location. I've been staying there every time I come to Lethbridge. There was a pool for my 2 grandchildren and easy access to it from our room. They loved the pool. Close to friends we were visiting - every things close in Lethbridge. Rooms and hotel clean. The breakfast in the morning!